0.1 Planning a Gran Canaria holiday? You’ll need a roof over your head, won’t you? Our latest hotel review of Playa del Inglés’ Riu Palmeras might come in handy. Planning a Gran Canaria holiday? You’ll need a roof over your head, won’t you? Our latest hotel review of Playa del Inglés’ Riu Palmeras might come in handy. First things first, we’ll describe how you reach the four-star Riu Palmeras and then supply a rundown of their facilities and services. Concluding with a taster of the food and drink options on offer at this four-star establishment. You’ll come across Riu Palmeras in Playa del Inglés, close to the beach without actually being on it. It’s also within walking distance of in-your-face Yumbo Centrum and a hop, skip, and a jump away from the decidedly more chilled C.C. Sandía. Number 1 Estados Unidos de América, for that’s the hotel’s actual address, is just over 20 minutes by car and slightly under an hour by Global bus if heading from Gran Canaria airport. Riu Hotels & Resorts are based in Mallorca where they were formed by the family of the same name back in 1953. The third generation of familia Riu still run the firm although they’re now backed by the TUI group. 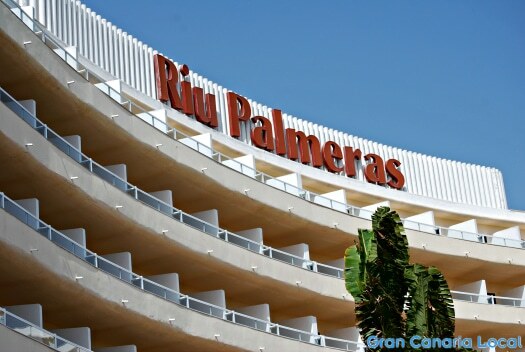 Riu Palmeras, which opened in 1985, was the company’s first hotel outside the Balearic Islands. The main hotel’s home to 230 cosy double rooms and more generously proportioned suites with our one enjoying a view of the area’s celebrated dunes. The complex also houses 36 duplex family bungalows in the form of Bung Riu Palmitos. Whilst there’s a gym and children’s playground, we feel this Riu is more suited to an older visitor lapping up the sun or keeping cool by the pool in the shade provided by the palm trees from which the hotel takes its name. When Mr Gran Canaria Local visited, there seemed to be a disproportionate number of middle-aged German daughters holidaying there with their mothers. Cue lots of Halloing when Mr GCL was mistaken for a fellow Teuton. On the entertainment front, the Abba tribute band were good fun in a very non-ironic way (no nods to Alan Partridge) but Mr Gran Canaria Local preferred the birdsong which made him feel like he was in the middle of the countryside rather than in the island’s largest resort. Riu Palmeras is not an all-inclusive hotel. Both half- and full-board packages are available but you’ll have to pay extra for your drinks. Which has its upsides as well as its downsides. The positives are a greater range of alcoholic beverages to choose from. Mixers including cocktails are prepared fresh rather than staff serving your choice from a pre-made vat. The emphasis is very much on quality over quantity. The negatives? You’ll have to settle your tab on departure. Mr GCL had to shell out 5,60€ for a glass of red wine to accompany his dinner and 9,35€ for a couple of rum and cokes which were however stronger than their todo-incluido equivalents. There’s a snack bar next to the pool if you’re in an everything-with-chips type of mood. The main buffet restaurant opens for breakfast, lunch, and dinner with two themed cenas weekly. There’s also Sir William á-la-carte restaurant which you can reserve a dinner at for no extra cost. On the night Mr Gran Canaria Local stayed, the buffet restaurant was hosting an international night. So he started with a light-rather-than-hearty lentil soup which he checked had been prepared using a vegetable stock. Before helping himself to some thin-crust veggie pizza, punchy meat-free lasagne, and big-boy tomatoes stuffed with rice and tofu. Disclaimer: In exchange for a review, Mr Gran Canaria Local stayed on a half-board basis at Riu Palmeras for free. Rates fluctuate owing to a dynamic booking system. You can check out the latest deals at Riu Hotels & Resorts.